Thirty mile-long Texada Island, the largest of BC’s Gulf Islands, lies in the middle of the Strait of Georgia. 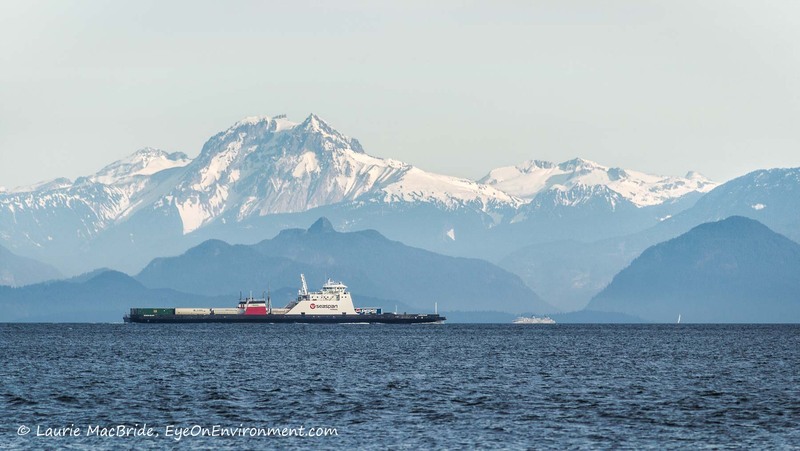 With a high elevation, it’s a dominant landmark for boaters crossing the Strait between Vancouver Island and the mainland coast. The island has a colourful history that includes whaling, mining, farming and at least a couple of significant shipwrecks. It had an opera house at the turn of the 20th century and during prohibition, produced and supplied illegal hootch to the US black market. Today it’s quieter and more focused on outdoor tourism, but no less interesting, I expect. I say “expect”, because Texada remains a bit of a mystery to me. Though I’ve passed by it more times than I can remember and I’ve lived in southwestern BC my entire life, I’ve only been on the island a couple of times. The reason is not lack of curiosity, but the island’s mid-Strait location. Crossing the Strait in a small boat (or “crossing the Gulf”, as old-timers call it) can be a challenge. When a strong southeast or northwest wind is blowing, it builds strength as it sweeps along the 135 mile-long waterway. The resulting steep waves come at you broadside if you’re trying to get across the Strait – giving you the choice of rolling for the three or four hours needed to reach the other side via the shortest route, or taking a longer course to avoid the worst of the roll. Neither option is much fun. But lest I scare anyone off, it’s worth noting that there are also plenty of days when the Strait is a gentle delight to cross, as it was earlier this summer when I took the photo above. We’ve had many calm crossings over the years, a result of choosing our timing carefully (along with some luck). Even on a calm day, though, we know that weather conditions can change rapidly – which is why, instead of stopping to explore Texada, we always push on to complete our crossing. Perhaps some day we’ll make the island our destination, but for now, caution prevails over curiosity – so I’ll continue to appreciate Texada from a distance. 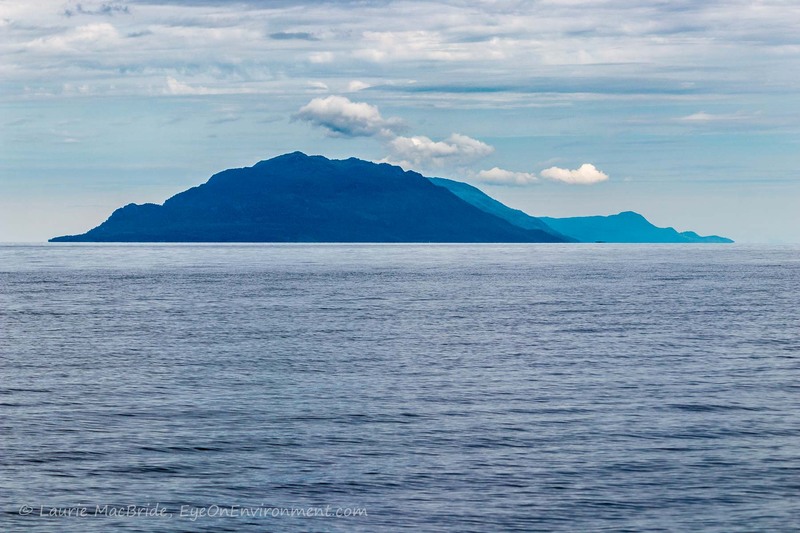 Posted by Laurie MacBride, Eye on Environment on September 4, 2018 in BC coast, Boating, Coastal History, South Coast & Vancouver Island and tagged blue, boating, Georgia Strait, Inside Passage, islands, nature, ocean, places, Strait of Georgia, Texada Island, weather. I think whoever gave the name “Evening primrose” to the Oenothera genus of plants made a bit of a blooper. If the ones that volunteer in our garden are any indication, they neither look like a primrose, nor bloom in the evening. The flowers on these large, upright plants open first thing in the morning (the photo above was taken at 5:38 am). 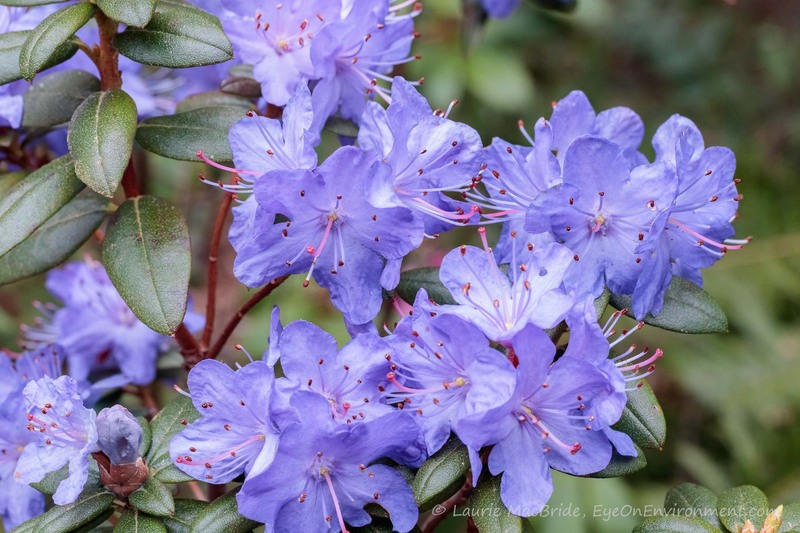 Although each individual flower lasts only a day, the plants bloom all summer, bringing so much light and colour that we welcome them, despite the space they take up among the fruit and veggies. By afternoon, though, their beautiful yellow flowers are limp and droopy, and by evening they’re completely done in. Kind of like me, come to think of it. 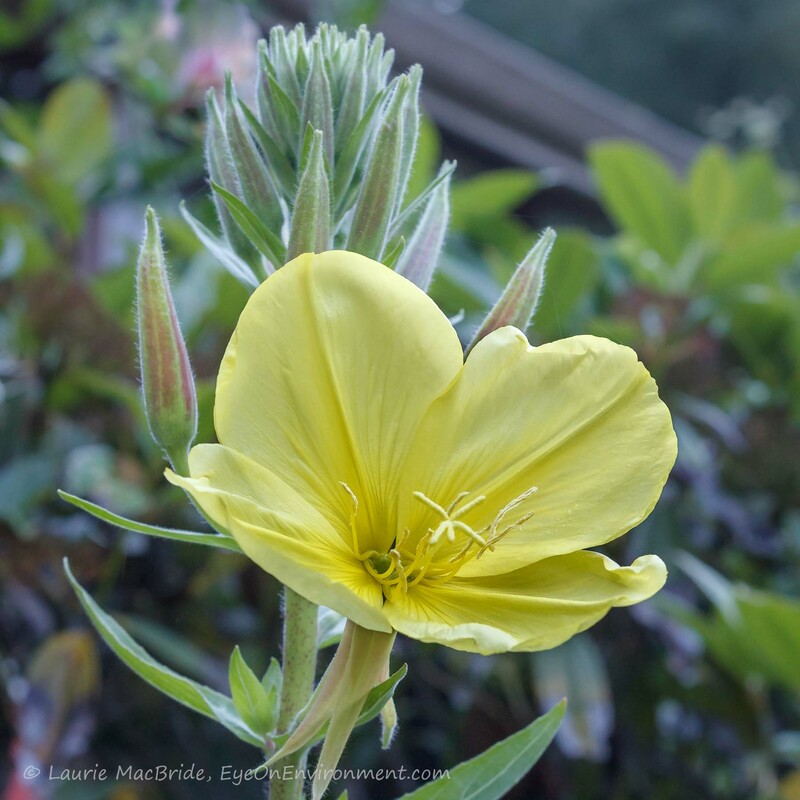 Posted by Laurie MacBride, Eye on Environment on July 3, 2018 in Garden and tagged beauty, colours, flowers, gardening, light, nature, Oenothera, plants, summer, yellow. On a magical morning a few weeks ago, I watched in awe from our boat as a virtual metropolis of luminous moon jellies and other planktonic creatures drifted through our anchorage. As the long, waving curtain of strange and wonderful life forms pulsated alongside and past me, the effect was like watching an underwater aurora – an extraordinary moving light show in slow motion. Like all living creatures, human beings are utterly dependent upon the ocean, for the air we breathe, temperature regulation, sustenance, inspiration and so much more. The ocean covers almost three quarters of our planet’s surface, yet despite our big brains, our species has only explored about 5% of it. We have barely a nodding acquaintance with our very lifeblood. Our beautiful, watery blue planet holds amazing worlds within it – worlds that seem to me more mysterious and awesome than anything in science fiction or outer space. It’s always baffled me why some humans would want to go the moon or Mars, when there’s so much mystery, so much still unknown right here on our very own planet Earth – as the moon jellies reminded me that magical morning. 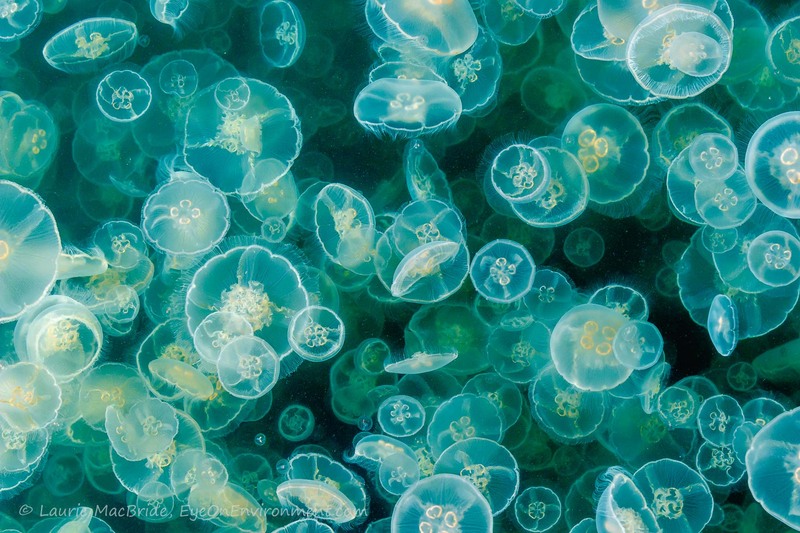 Posted by Laurie MacBride, Eye on Environment on June 25, 2018 in Animals & Wildlife, BC coast, Boating, Musings on Life and tagged Cnidaria, ecology, jellyfish, light, marine biology, mystery, nature, ocean, underwater, wildlife. Although both Anna’s and Rufous hummingbirds frequent our place, their nests have been elusive over the years. Two or three times we’ve found one on a Western redcedar bough, but otherwise, nothing. Seems these tiny birds are masters in the art of camouflage when it comes to nesting. Until now. To our surprise, a female Rufous has built her nest on one of the metal wind spinners hanging from the eaves along the north wall of our house, allowing us a clear, almost eye-level view (keeping a respectful distance, of course). It seems an odd location: just ten feet from our carport, the front porch and a very popular hummingbird feeder. So despite the care we’re taking not to disturb her, there’s still a fair number of comings and goings – especially when multiple male hummers are speeding about, jostling noisily for control of the feeder. It’s as if Mrs. Hummy was afraid of being bored, so chose the busiest spot she could find. But it has some advantages. 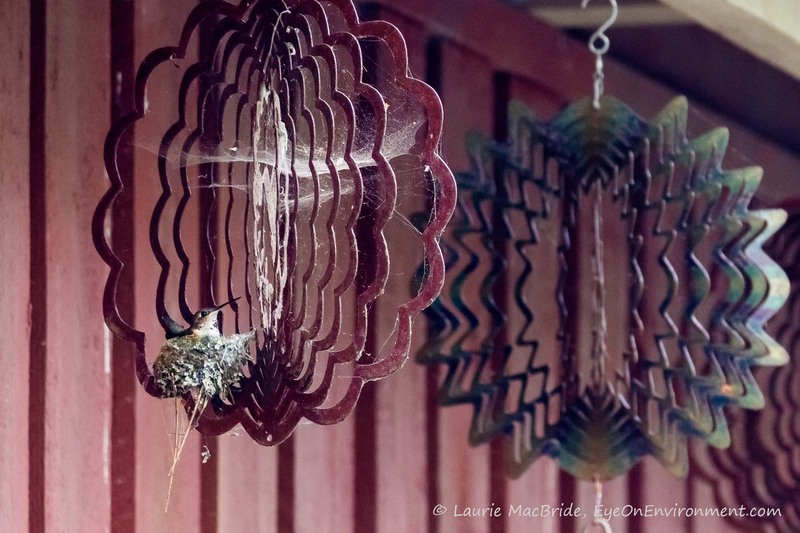 The house and eaves offer shelter for the future nestlings, protecting them from sun, rain and wind, and the spinner’s movements are gentle in this protected spot. She can keep an eye on the nectar feeder and get to it easily when those pesky males aren’t around. And I expect that fresh insects – her favorite food – are regularly caught in the copious spider webs on the spinner, so a nutritious bite is just a quick hover away. Or maybe it’s something else entirely. Perhaps she was drawn by the big metal hummingbird at the centre of the wind spinner: a perfect talisman to protect her from harm and get the new generation off to a healthy, successful start in life. 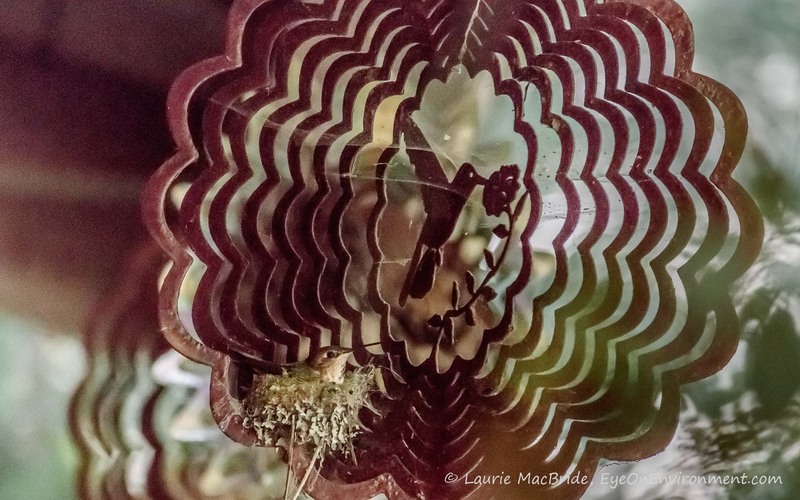 Posted by Laurie MacBride, Eye on Environment on May 17, 2018 in Birds, Musings on Life and tagged animal behavior, bird nesting, bird watching, hummingbirds, nature, nesting, Rufous hummingbird, spring, wildlife. Much as I love magnificent scenery, I don’t focus my camera lens on it very often. Instead, I tend to be drawn to the more “intimate landscapes” to be found in nature – smaller, quieter scenes contained within the larger vistas. The allure of small tableaux may be subtler than that of grand landscapes, but subtlety is part of their attraction for me. To really see them, I need to look closely and clear my mind of the usual distractions. Taking the time and quiet space to do this is good medicine for me. As I observe their unique features, colours, textures, shapes and patterns – along with the way so many of these little scenes change over the seasons and years – these intimate landscapes work their magic on me…slowly, quietly, simply. Seeking out, seeing and photographing intimate landscapes is a process that strengthens my appreciation of the natural world and renews my passion for its rhythms, life cycles, beauty and diversity – and of course, its fragility. Intimate Landscapes is the title of my new solo show, on now on Gabriola Island. It features about two dozen mounted photographs from numerous islands and other locations along BC’s west coast. The show runs through May 8. 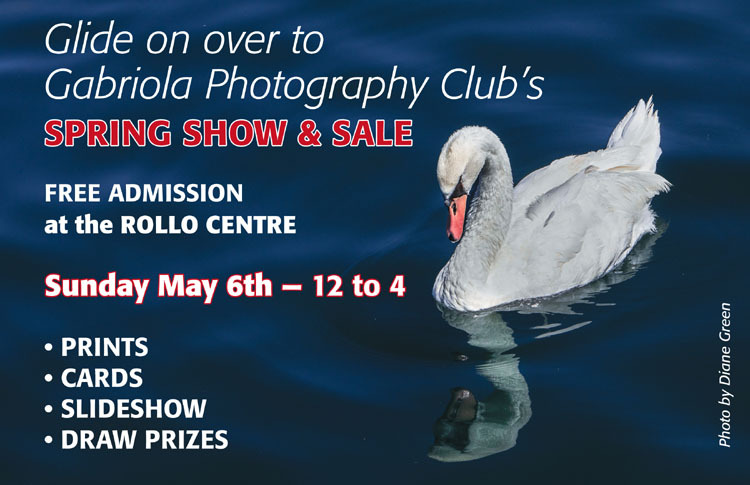 If you’re on Gabriola between now and then, I hope you’ll drop by to check it out. 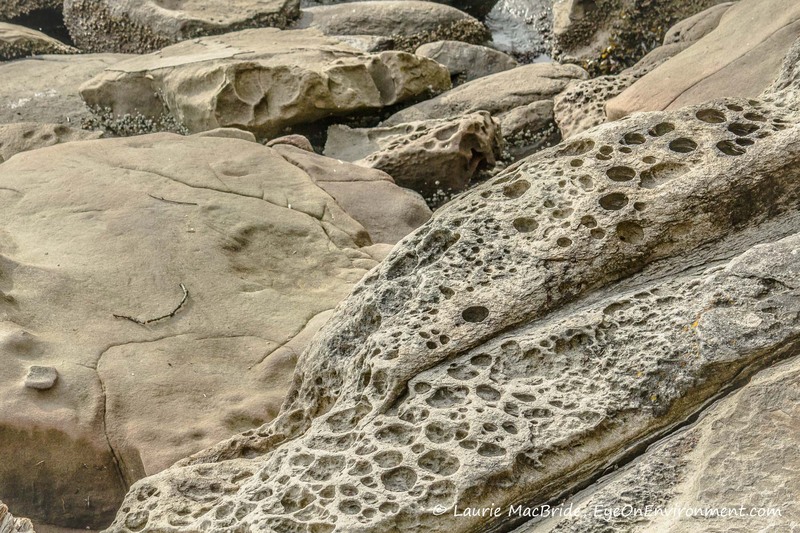 Posted by Laurie MacBride, Eye on Environment on April 4, 2018 in BC coast, Gulf Islands, Musings on Life and tagged environment, erosion, Gabriola, landscapes, nature, photography, quiet, sandstone, shoreline. Spring has been slow to arrive this year, but I think it’s finally here. Which means it’s time for me, like the crocuses, to emerge from my lengthy slumber. There’s much that needs to be done in our garden, a fact which seems daunting right now considering how sedentary I was over the fall and winter. I’ll pay for that indulgence in aches and pains galore, I know – but the aesthetic and edible rewards that lie ahead should make it all worthwhile. 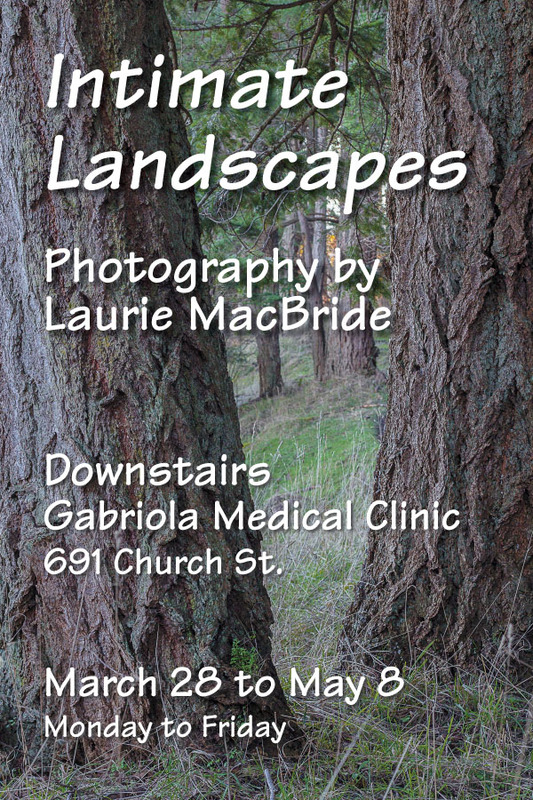 My new solo photography show, “Intimate Landscapes”, opens March 28 and runs to May 9, at the Gabriola Community Health Centre, 691 Church St. (downstairs, Monday – Friday). If you’re on the island I hope you’ll stop by to see it. While you’re there, head upstairs as well, for a new show by fellow Gabriola photographer, Dirk Huysman. 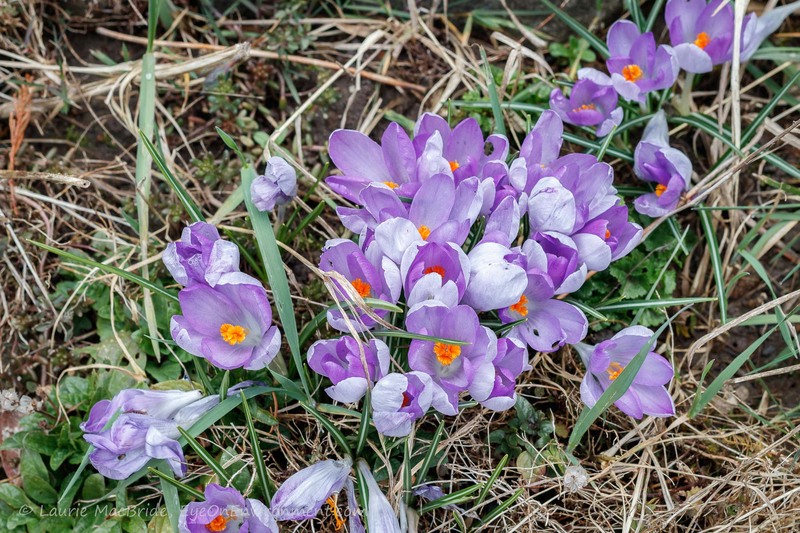 Posted by Laurie MacBride, Eye on Environment on March 23, 2018 in Garden, Musings on Life and tagged crocus, exercise, flowers, gardening, nature, photography, plants, seasons, spring.